"We Saved Over $1,600 On our total!" "Our office has been ordering postcards from ReaMark for the last four years. I am very impressed with how easy and smoothly the entire process is when placing group orders. My colleagues and I have saved thousands of dollars by combining our orders and taking advantage of the great group discounts. Your quality products, customer service and low prices are the best! Thanks ReaMark!" �I Will Never Go Anywhere Else!" �I sold over 8 million dollars worth of real estate last year.!" "I really like the way ReaMark does business! They have great products to help me promote my business. I sold over 8 million dollars worth of real estate last year. In addition, I have a 2-year old and I am also a co-owner of the company so I don�t have time to waste. ReaMark�s staff are knowledgeable, efficient and very helpful. They are also fun to work with. To me dealing with happy and helpful people always make my day! 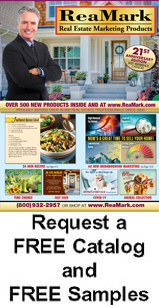 Ordering from ReaMark is a GREAT experience that I plan to keep repeating! I really value their professional assistance as well as their wonderful customer service. I highly recommend ReaMark to everyone! Thanks for everything!" Group Order� Combine Your Orders To Maximize Your Discounts! 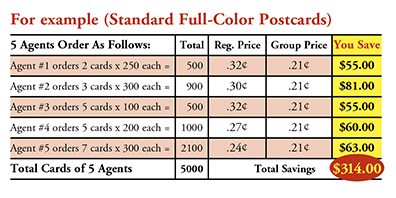 Group orders receive the combined quantity discount for all the agents in the group at the time the order is placed. Each order within the group order is treated as an individual order so that each agent may select his/her own cards and personalization. Each agent is responsible for individual shipping charges based on his/her order total. Each agent will receive an individual layout proof. Order production will start when we receive the agent's layout approval. Orders do not need to wait for other agents approvals in the group. a. Each agent completes his/her own order form - Click here to print a copy of the order form. b. Add up all card quantities from all agents' orders. Use the total quantity to find the individual card price on the pricing chart. c. Each agent adds applicable fees: CA sales tax (for CA agents only). d. Each agent calculates shipping charges based on order total. See shipping chart for rates. e. Email us your photo/logo to mail@ReaMark.com. E-mailed photos must be at least 300 dpi, in .jpg or .tif format and 2" x 2" or larger.